As I am sucrose intolerant I have a lot of bottles of things in my fridge that I have made from scratch. You will find sweet chilli sauce in there among all the other bottles of lovely goodies, including harissa and pesto and tomato and chilli chutney. What you won’t find is marmalade as for some strange reason fructose does not work the same as sugar at this temperature. I will one day get myself some sugar free jam sugar and have a go at making my own jam. But, in the meantime St. Dalfour do a more than respectable sugar free jam (or six) which I love to slather on my home made bread. Another perfect addition to a bread lunch is piccalilli. These pickled vegetable take on a lovely yellow hue from the turmeric and are easy to make. I keep the crunch in them as I like the texture. Do give it a go, and make sure to set aside enough glass jars to start – this makes 6 small jars, or have one large jar to hand. I like to give my ‘canning experiments’ away as gifts so I always make use of smaller glass jars. This was originally published on the 27th of September 2011 – in the uploading of my old blog to my new one, this post did not transfer properly and I lost the post as well as the 28 comments. 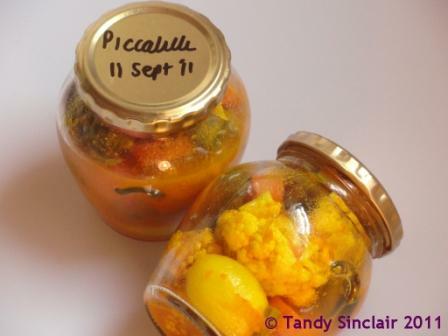 I love piccalilli and this looks realy delicious, Tandy! Sorry to hear that you lost the original post! I am sorry it got lost too! This looks like a wonderful piccalilli; much better than the shop bought ones. for sure it is way better! We love Piccalilli in this house and I have been meaning to make some for ages. You have moved it up my list of things to do. I’ve never heard of this condiment before but it sounds super tasty! Makes me nervous to think about moving over to .org – eek. Mandy, if you are going to move, send me an email – this does not happen under ordinary circumstances! I love picallili and it´s about time I made some…your recipe looks like a great one! I love Piccalilli and this looks a good one.